Multiple Pet Discount: Receive 10% off on Services when you bring more than one pet. Rexdale Animal Hospital is pleased to welcome you to our website. Our website is full of information that will help introduce you to who we are and what we do. We are here to help your Pets and look forward to working with you.We are a full service animal hospital and provide a full range of services like Surgery, Dentistry, Digital X-Rays, Diagnostic Blood Testing, Ultrasound, ECG, Hospitalization, Grooming and Boarding. We achieve success for your Pets through the use of clarity, and the understanding of your needs. You will find what you are looking for with the services that we offer. We stand behind our services and know that we will deliver the satisfaction that you are looking for. At Rexdale Animal Hospital, we treat your pets like the valued family members they are. Izabela has been with us for the past year. She is a graduated from B-Pro, the only grooming school recognized by the government of Ontario. Izabela likes both cats and dogs but her pets are 3 cats Puffy, Mila and Homie. She is very sweet, gentle and takes time and pride in her work. From the shave down to the fancy poodle styles she can do it all. Our clients lover her work and keep coming back to see her. Melodie is the youngest team member of Rexdale Animal Hospital. She is friendly, talkative and artistic. She loves, loves, loves to play with dogs and is also very good with computers. Melodie is working hard at school in hopes to get into Guelph University to become a doctor in veterinary medicine. Dr. 'B' as his staff calls him has been practicing Veterinary medicine since 1986. He is a proud family man who came to Canada with his wife and two kids and is a very pleased to have Cyrus as his loyal companion, a toy poodle who takes him for many walks during the day. Dr. Bhullar is a very peaceful, easy going person who will go an extra mile to help an animal or a human in need. Dr. Bhullar is really horrified by the way humans process animals for food consumption, In his ideal world we would all be vegetarian. 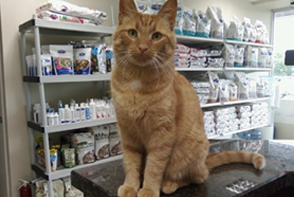 Our head receptionist, Alex has worked at Rexdale Animal Hospital for the past 3 years. She started out as a Co-op student and is on considering becoming a vet tech. Alex is fluent in English, Spanish and Sign language. If you want service with a smile, she has a very pretty one and is always happy to share it. "I bring all my animals here and I would never go anywhere else the staff is terrific and DR Bhullar is great"
"Bronx feels comfortable with the wonderful, caring staff. We get calls to check up on how Bronx is doing and reminder calls of our appointments."